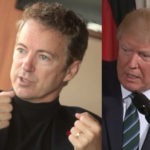 Senator Rand Paul took to Twitter just before Christmas and ranted in a bizarre tweetstorm about his love for “President” Donald Trump and about Festivus and being able to say “Merry Christmas” again. Someone should check on Paul, as it was a most bizarre outburst. Rand Paul also praised John Bolton, a war hawk by every definition, whom Paul suggests will end all wars and lead us to disengagement. He topped it all off with a bizarre rendition of a border wall with spikes with a giant cat on one side with laser beam eyes. This has become a Rand Paul tradition, channeling his grievances, but his apparent loss of any semblance of sanity is dangerous, to say the least. His posts this Festivus are delusional, but perhaps also remind us of just how aligned with Donald Trump he’s become in every way.